Savor the colors, the flavors and the tapestry of delicious recipes created to reclaim your vitality and energy. 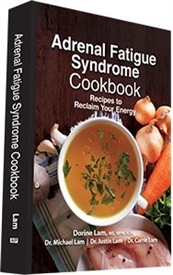 Throughout Adrenal Fatigue Syndrome Cookbook, you will discover over 140 recipes that are visually delightful, appetizing and ultimately healthy. From salads and soups to savory meals infused with the offerings of the seasons. Coupled with the mouthwatering recipes from nutritionist, registered dietitian and chef Dorine Lam, Drs. Michael, Justin, and Carrie Lam provide advice and recommendations on recipes specifically designed for various stages of Adrenal Fatigue Syndrome. Included are nourishment concepts and strategies combined with wholesome food principles from ancient times. The delicious recipes focus more on vegetables, beans, nuts, fish and poultry because they are easily broken down into nutrients that a weakened digestive system easily handles. Enjoy Mahi Mahi with Cucumber Pineapple Salsa, Teriyaki Chicken with Summer Squash, Bok Choy Cherry Salad, Lemon Basil Pasta, Roasted Bell Pepper Soup, Almond Meal Pizza, Pearl-Barley Risotto and so much more!